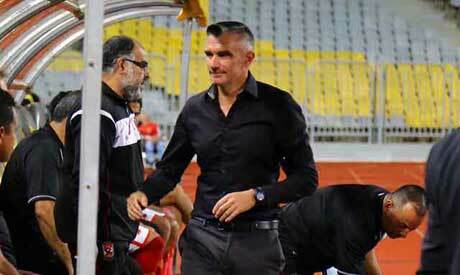 One of the priorities of Ahly coach Patrice Carteron is to bring the African Champions League trophy back to the Cairo giants after a five-year absence, the Frenchman said on Wednesday. Ahly are the record winners of Africa's flagship competition but have not won the trophy since 2013. They came close to winning a ninth title last year but lost to Morocco's Wydad Casablanca 2-1 on aggregate in a two-legged final. Carteron, who took over at the club following the departure of Hossam El-Badry in the summer, knows best when it comes to the Champions League, having led DR Congo's Mazembe to the coveted title in 2015. "I won the Champions League with Mazembe and I know how important it is. When I first visited Ahly club and saw the competition's trophy, I said I 'want to bring it back'," Carteron told Ahly's television channel. When the 48-year-old took the reins, Ahly were struggling in the group stage, having collected a solitary point from their opening two matches which included a shock loss to Uganda's Kampala City. He turned around their fortunes, with the Red Devils recording four straight wins, including an impressive victory at Tunisia's Esperance, to advance to the quarter-finals as the group winners with 13 points. Ahly will face rank outsiders Horoya of Guinea in the last eight. "The players helped me and we managed to improve our results to finish as the group leaders." One of the players who stood out is experienced Malian defender Salif Coulibaly, who also played under Carteron at Mazembe. Coulibaly's composed style in the heart of a four-man defence and his aerial prowess, which saw him score three goals in nine appearances with Ahly in all competitions, proved an asset for the team. "I needed a player who would adapt to the team quickly and I already knew Coulibaly from my time at Mazembe," Carteron said of the 30-year-old, who joined Ahly on a free transfer in the summer. "He is a very important player and the club really needed someone of his attributes."